The ALFA Tube-U(V) High-Power Outdoor USB WiFi Adapter makes a connection to distant WiFi-Hotspots very easy. The Realtek RTL 8188EU chipset of the ALFA Tube-U(V) supports the 802.11b/g/n wireless networks with a maximum output rate of 500mW/23dBm. This outdoor-suitable WiFi USB Adapter ALFA Network Tube U(V) is weatherprotected and intended for a connection to a PC, Mac or the ALFA Network R36 Extender Router. The ALFA Tube-U(V) replaces the internal wireless network card within the computer. The possibility to position the device at an elevated outdoor position and the high permormance characteristics, allow a good connection to more remote WiFi hotspots. Recognizing, managing and also saving preferred networks is very easy with the included software. The security encryptions, all current security encryptions are supported, can be configured with the software. The operation of the ALFA Tube-U(V) is also possible with Windows on-board devices and device drivers, which means that the included software is not absolutely necessary. The housing of the ALFA Tube-U(V) is waetherproof, UV-resistant and splash-proof, which makes it suitable for all environmental influences and is ideal for use on yachts, boats or campers. The ALFA Tube-U(V) has an N-Type antenna port and can be connected to any Outdoor WiFi Antenna with a N-Female connector. Ideally this antenna is screwed directly onto the N-Type connector. 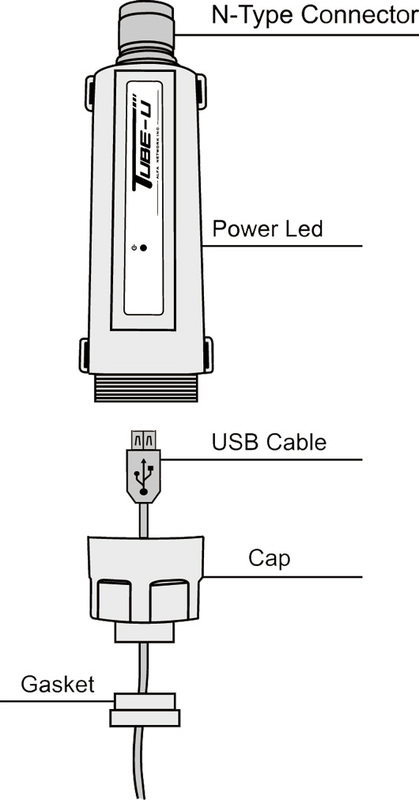 The USB connector of the ALFA Tube-U(V) is at the lower end and is enclosed by a water-protected cable entry. You can easily attach the ALFA Tube-U(V) to masts by using the included cable ties and tabs on the edge of the case. If no mast is available, the ALFA Tube-U(V) can be connected to a stndard marine mount with the ALFA TSM1 Adapter. Suction and magnetic mounts for Action Cams are also a possibility for fastening thanks to the 1/4'' female thread of the ALFA Tube-U(V). The IEEE 802.11b/g/n radio networks are supported with a transmission rate of up to 150Mbps in the 2.4GHz frequency range. The ALFA-TubeU(V) is equipped with a Realtek RTL 8188EU chipset. Windows, Mac OS and Linux are supported by the ALFA Tube-U(V). Operation with IOS and Android is possible in combination with an ALFA Network R36.